Turnkey corn cooking system to convey a continuous flow of cooked corn from a batch atmospheric double jacket steam injection cooker. System includes a double jacket steam kettle, corn transfer pumps, steeping tanks, corn washer, corn feeder and corn grinder. Touch screen controls make working the process very simple to any operator. Corn cook, simmer and steeping system consisting of a double jacket steam kettle, corn quenching tank, corn transfer pumps,steeping tanks, as production capacity requires. Depending on production parameters, the following specifications may apply. Running time: 8 to 24 hours. 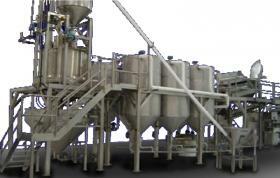 Dry corn batch capacity: 1,000 to 3,500 Lbs. Cook water per batch: 185 to 500 gal. Incoming cook water: 60 deg. F.
Incoming dry corn: 60 deg. F.
Simmer time, Tortilla Chips: 10 min. Simmer time, Corn Chips: 25 min. Simmered corn after quench: 140 deg. F.
Fill, cook, simmer, steep cycle: 6 to 12 hours. Cook batches per steep tank: one.